A month ago the kind folks from BodyMedia sent me one of their LINK armbands to test drive. I was excited as I'm clearly into collecting and quantifying data - for instance I haven't missed an entry in my food diary for over 2 years and regularly log my workouts on Fitocracy. 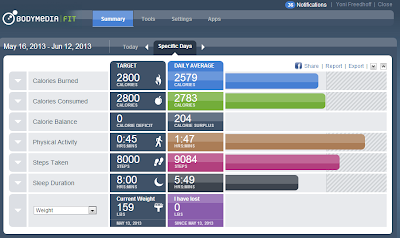 I was curious to see if having access to real time activity data would change my own exercise behaviours. For me the short answer is probably not. I did love the information I got from the LINK, I checked it regularly, but more to see how much I'd done rather than to push myself to do more. I also questioned the data some. As far as what the LINK tracks it covers calories it thinks you burned, calories you tell it you ate, how long it thinks you were moderately or vigorously active, how many steps it thinks you took and how long it thinks you slept. The LINK armband (it's the one the The Biggest Loser contestants use) sits just above your bicep via a stretchy band with a velcro fastening. It's not water proof so you've got to take it off in the shower and the band does get sweaty with vigorous workouts (but is washable). The other issue I had with it was as a shirt and tie wearing guy. I found it tough to put back on without taking off my shirt. I have to admit, I notice wearing it. When I loosen it to the point of not feeling it periodically I will lose the connection to my arm (it sounds a few notes to say it's signing off) and keeping it tight I definitely feel it all day long and every once and a while the area in contact with the skin gets a bit itchy. Following the data is easy if you have a Bluetooth enabled Smartphone whereby you simply press a button on the armband and your data will then stream live to your phone. You can also use your phone to upload your data to the website tracker. Food wise I'm not using their food diary. 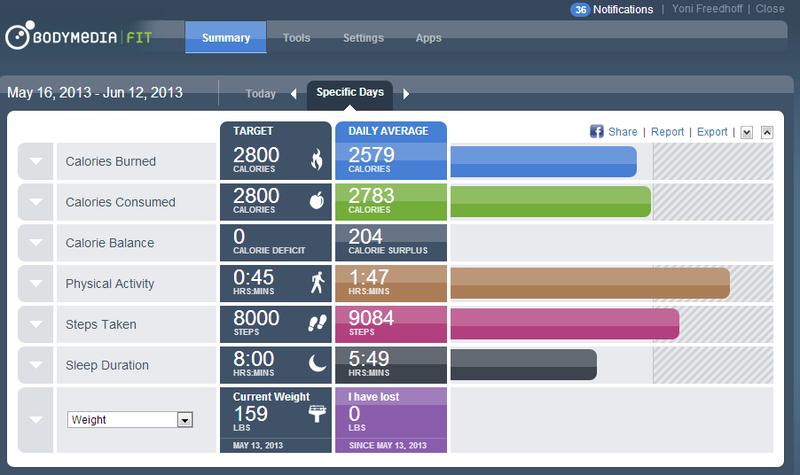 Instead the LINK syncs with myfitnesspal (my current tracker) which is quite convenient. What I don't find convenient however is that communication is two way in that the LINK tells myfitnesspal that I've burned calories and myfitnesspal then tries to tell me to eat more to make up for them. For folks using a LINK in the context of weight management, this may well inspire, "because I exercised" over-indulgences. As far as the data's accuracy, I personally think it's overestimating some. While I do workout an average of 4-6x weekly, I'm convinced it sometimes tracks my typing as activity. Apparently I'm not the only one thinking this way as Gretchen Reynold's NYTs piece yesterday speaking to the accuracy of a whole pile of these sorts of monitors references the armband that overestimated typing too. The price for the unit seems quite fair in and around $100 depending on the retailer, but I am a bit surprised by the monthly fee for the website and app. My understanding is that the website will only provide you with very basic information without a subscription while the app won't work at all. Given the now highly competitive landscape of exercise trackers, and with this one being slightly less wieldy consequent to the armband (rather than a bracelet or something pocketable), I'd expect they'd be better off throwing in as many free bells and whistles as possible. All in all I'm not sure if this gets my buy recommendation. I say I'm not sure because to be fair, I haven't tried out any other trackers. I think I'd be more comfortable recommending if it weren't for the subscription fees as all of my other complains and issues were minor. That's my month long data summary up above - now if someone could just teach me how to sleep better.